On Easter Sunday 2009, 22-year old Army Specialist Brendan Marrocco, 2nd Battalion of the 27th Infantry Regiment, was at the wheel of a Mine Resistant Ambush Protected (MRAP) vehicle. He was driving the last vehicle in a convoy of four, which was returning to Forward Operating Base Summerall in Bayji Iraq. He had just escorted other U.S. soldiers to the Siniyah Joint Security Station. The first three trucks passed the sophisticated roadside bomb without incident. The bomb, known as an "anti-armor IED," or an "explosively formed projectile" (EFP) exploded into Marrocco's vehicle. The armor-piercing projectile punched through the middle of the driver's side door. The blast tore off both of Marrocco's arms and his left leg. His right leg was mangled beyond saving. His carotid artery was severed, his body badly burned, and vision in his left eye was severely damaged. Brendan was kept from bleeding to death by his platoon’s 21-year old medic and his fellow soldiers. Marrocco was airlifted to the trauma hospital at Contingency Operating Base Speicher, outside Tikrit. Soon after the medevac helicopter delivered Marrocco and the other wounded, the call went out to wake the soldiers stationed at Speicher, asking them to roll up their sleeves for a massive emergency blood drive. He was resuscitated, stabilized and underwent emergency surgeries. He was then flown to a hospital in Balad, and finally on to Landstuhl Regional Medical Center in Germany. Brendan would need as many as 60 pints before he left Iraq. 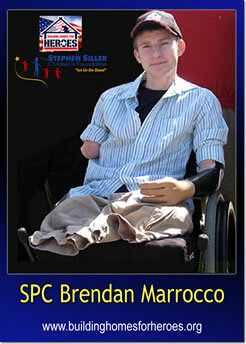 Three days after the attack, Brendan arrived at Walter Reed Army Medical Center. He is the only soldier to lose all four limbs in combat in Iraq or Afghanistan. Brendan made it clear soon after arriving at Walter Reed that his goal was to stand on the runway on his new legs when his unit returned from Iraq. Five weeks into his stay at Walter Reed, Brendan began working with his first prosthetic legs – an 18-inch starter pair called “stubbies.” As he mastered one set, he moved to taller, more sophisticated ones, with articulating knees and electronic components that help with movement and gait. He is now on his third set of legs. One very important factor in Marrocco’s recovery has been the support from his family. Brendan’s older brother, Mike, quit his job with Citibank in Manhattan and moved to Walter Reed soon after Brendan was injured. On a typical day at Walter Reed, Brendan and Mike head to physical therapy at about 9 a.m., Brendan stretches, puts on his prosthetic legs, and then takes a lap using a walker around the Military Advanced Training Center track. Then, Brendan continues doing laps, without the use of the walker, usually walking until 11 a.m. Next up is occupational therapy and working with his arms. The brothers get two hours for lunch and doctor’s appointments, then go back for more arm work. Building Homes for Heroes and The Stephen Siller Children’s Foundation joined forces to build a home for Specialist Marrocco on Staten Island.